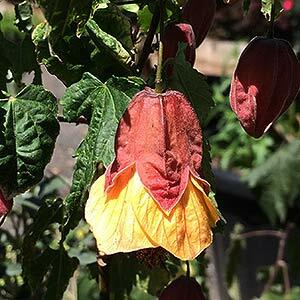 Another easy care shrub, Abutilon x milleri (Abutilon milleri) is tall growing and with a tendency to produce long arching branches due to the thin natures of its growth. The flowers are pink and orange with a red flush. Is best pruned regularly as it flowers on new growth. Abutilon milleri is an evergreen shrub that flowers prolifically from spring to autumn and in some areas throughout the year. The white flowers have a translucency that is a reel lift in part shade. Best pruned hard in spring if needed and can be tidied up a little in summer if needed. Propagation is also from cuttings, so while you are pruning why not try to strike a few of the cuttings. Whitefly and scale can be minor problems, both easily controlled.